Oxford University Press, USA, 9780199778928, 369pp. In A Great Aridness, William deBuys paints a compelling picture of what the Southwest might look like when the heat turns up and the water runs out. This semi-arid land, vulnerable to water shortages, rising temperatures, wildfires, and a host of other environmental challenges, is poised to bear the heaviest consequences of global environmental change in the United States. 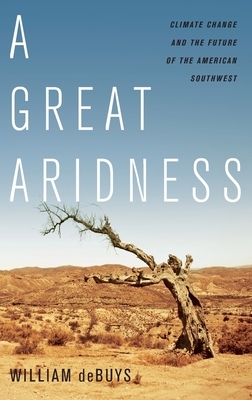 Examining interrelated factors such as vanishing wildlife, forest die backs, and the over-allocation of the already stressed Colorado River--upon which nearly 30 million people depend--the author narrates the landscape's history--and future. He tells the inspiring stories of the climatologists and others who are helping untangle the complex, interlocking causes and effects of global warming. And while the fate of this region may seem at first blush to be of merely local interest, what happens in the Southwest, deBuys suggests, will provide a glimpse of what other mid-latitude arid lands worldwide--the Mediterranean Basin, southern Africa, and the Middle East--will experience in the coming years. William deBuys is the author of seven books, including River of Traps: A New Mexico Mountain Life, a New York Times Notable Book of the Year and a finalist for the Pulitzer Prize in general non-fiction in 1991; Enchantment and Exploitation: The Life and Hard Times of a New Mexico Mountain Range; The Walk (an excerpt of which won a Pushcart Prize in 2008), and Salt Dreams: Land and Water in Low-Down California. An active conservationist, deBuys has helped protect more than 150,000 acres in New Mexico, Arizona, and North Carolina. He lives and writes on a small farm in northern New Mexico.